A Nova Scotia dealership group's $100,000 contest took an unexpected turn from the showroom to the courtroom when disappointed finalists sued the successful one. Now the four losers have lost a second time, and instead of getting a chunk of the prize, they’ve been ordered to pay the winner’s legal bills. 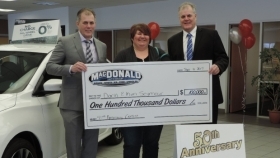 On Jan. 17, the MacDonald Auto Group of Halifax held a draw for a $100,000 grand prize to celebrate the company’s 50th anniversary. It began with a Nissan store and now also sells Ford, FCA, Kia and Toyota vehicles. The contestants had purchased a vehicle in the previous year. It was the dealer group’s biggest-ever promotion, co-owner Jim MacDonald said, although he has given away several cars over the years. The five finalists or their repre-sentatives attended, including finalist Darin Seymour’s wife. Before the drawing, they allegedly agreed to split the prize five ways, regardless of whose name was picked. At the drawing, the finalists were told that only one cheque would be issued but there was no restriction on how the winner later disbursed the money. Seymour won and his wife got the cheque, but the couple refused to divvy up the proceeds. The four disgruntled finalists sued the Seymours for breach of contract. Nova Scotia Supreme Court Justice Frank Edwards swiftly ended the case, finding that Seymour’s wife had no authority to obligate her husband to the agreement. The judge strongly suggested the disappointed losers lick their wounds rather than pursue the case further and ordered them to cover the Seymours’ $1,200 legal costs.